Since a dining room is a key area of your home, especially for entertaining, it should go without saying that well-considered, proper dining room lighting is an essential in any home, whether it’s just one simple lighting fixture or several layers of elegant lighting. And while it’s a multi-purpose space used for everyday eating and for hosting formal dinners, do study lighting standards of your dining room to ensure that you install proper dining room light fixtures to best serve you. For inspiration to light your dining room with elegance and ease, we took notes from our renovation experts and interior designers at Décor Aid for timeless approaches to dining room lighting. As home styling tends to get more and more relaxed and elements a little less rigid, one of the most surprising lighting trends for 2019 – you probably never saw coming. No we aren’t crazy, yes they were at all of the top interior design industry trade shows: exposed wiring and cords. Yes, you read that correctly. When done well, exposed cords can lend a room a chicly unfinished verve thats perfect for an easy, uncalculated feel. Another less traditional take our interior designers noted as an increasingly popular design trend were matte finished lighting fixtures that while stately in silhouette, were far from precious, for a thoroughly modern look. When it comes to casual dining room lighting fixtures ideas, go against the grain and opt for unexpected matte finishes for a truly unique look that no one else will have – just yet. As an enduring design style, it was only a matter of time before eclectic and Bohemian inspired styling lent itself to the best lighting trends 2019, and for good reason. As lighting can work to punctuate a room, you wouldn’t expect to see a grand crystal chandelier in an otherwise cozy, eclectic dining room, now would you? Complete an eclectic look with a globalized feel by bringing in exotic lighting fixtures that conjure up a sense of old-world glamor. Because playing with scale can be great fun and a savvy way to pack as much visual interest as you can in any room, when it comes to dining room lighting fixtures ideas, take it up or down a notch by playing with unexpected scale. 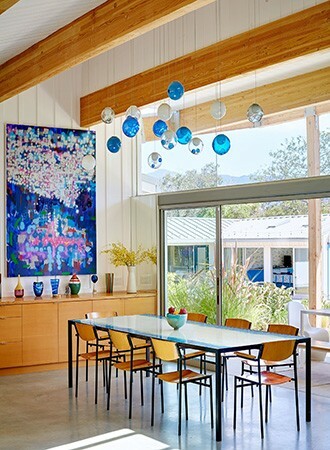 From a trio of miniature matching light fixtures to one massive, mesmerizing oversized lighting fixture, go bold and go for the unexpected for a truly remarkable, statement-making direction. One of the warmest and charming lighting trends of late, our designers saw a return to ceramic, almost handmade, lighting fixtures that instantly inject personality in even the most minimal of dining areas with ease. The key here is to opt for simple geometric designs and classic colors to ensure that you ceramic lighting fixtures remain in style for 2019 and beyond. Since a dining room usually features straightforward décor with a sense of symmetry and balance in mind, keep guests eyes away from the monotony of the room by layering dining room lighting fixtures ideas with different yet similar pieces. Like the room illustrated above, each lighting fixture has its own unique silhouette and scale, but since they are of the same color and finish, everything appears harmonious and far from random. With farmhouse living all the rage, it comes as no surprise that rustic lighting trends 2019 were among the most viable in seeing a major swift in design directions. From unfinished metal to reclaimed elements, rustic light ideas feel fresh and are a surefire way to bring your living room into the now. That said, we suggest not going too extreme with the theme as you’ll quickly find yourself bored and inspired if the fixture comes off as too literal, and even campy. With minimalism’s fresh return and penchant for lingering around thanks to its streamlined styling and timeless appeal, it comes as no surprise that the design style inspired stylish lighting trends for just about every room in any home. From subtle dining room lighting design ideas, to full-on minimalistic fetes of beauty, there’s something for just about everyone. That said, we suggest going for larger scaled lighting fixtures to make a grander statement rather than the quiet gesture pieces too small will evoke – leaving a room feeling incomplete and too sterile to boot. Because a dining room should always make a grand, well put-together statement, when it comes to lighting trends, consider it paramount to bring in memorable conversation-starters to truly make a unique statement. By brining in unique statement-making dining room lighting design, you’ll be quick to notice the mood-enhancing effect it will create throughout the room while boasting a distinctive appeal to it. A go-to for our interior designers over the past few years, celestial inspired styles remain one of the most popular lighting trends 2019 thanks to their graphic punch and inspiring, awe-evoking sense of beauty. From oversized to petite, there’s plenty of indulgent options to consider when creating a uniquely elegant, well-designed dining room that will remain unique to you. One of the buzziest of all dining room lighting fixtures ideas, sculptural, asymmetrical armed lights are certain to make a major statement in any dining room while adding a sense of stylish play for the unexpected. 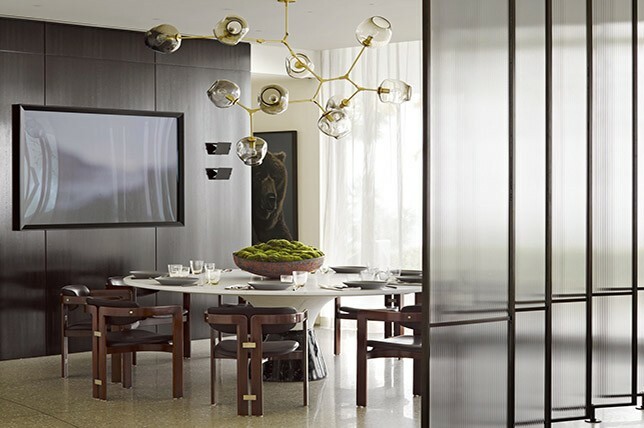 The key here is to add a sculptural dining room lighting fixture in a room that boasts symmetry and steadiness as in a more maximal, off-kilter dining room, the overall look would come off as haphazard and visually noisy. One of the more contemporary lighting trends of late, ring light fixtures are a great way of adding elegant drama and consistent lighting throughout a dining room. Thanks to their symmetry, ring light fixtures pair well with just about any design style and best of all, they also boast timeless design elements that will ensure that they always remain in style. Old-world elegant and somewhat common to use chandeliers as dining room lighting elements, there’s timeless beauty to be found in a classic crystal fixture. They can serve as the focal point of a dining space, making it easier for you to decorate with additional dining room light fixtures and decorative items. Our interior designers recommend using chandeliers that complement the overall interior design style of a home for a seamless visual feast. For instance, a decidedly modern, futurist crystal chandelier is ideal for a modern designed dining space as it’s a terrific option for those looking to invest and impress when sourcing modern dining room lighting. Pendant lights are somewhat similar to a chandelier in the sense that they can serve as a focal point for the dining room and add depth and character. But unlike a chandelier that comes with intricate lights and delicate details, pendant lights are popular options for dining room lighting as they have a more relaxed spirit and are in general, less precious and more robust. And since pendant lights are among the most popular dining room lighting trends, you’ll find them in a wide variety of designs, scales, and prices. If you’re on a budget but are looking to add an extra visual punch, these pendant dining room lighting ideas are a great starting point. When it comes to pendant lighting, consider oversized drum lights for easy drama. These are pendant lights that are often round in shape or with shapes similar to a drum. If you want to impress guests when hosting formal dinners, pendant drum lights are bold dining room lighting ideas to take note of. When using drum lights for dining room, position it in the middle of the room so it could cast diffused light throughout the room. You can also complement drum lights with a pair of lamps housed on a central console to provide extra ambient lighting when needed. Wall sconces for dining room lighting design ideas are another inexpensive option for illuminating your dining space. Sconces are individual dining room lights installed on one side or both sides a the wall. Our designers also recommend using wall sconces when looking to complement a chandelier or pendant lights as they’ll illuminate a major lighting fixture from below. Plus wall sconces can also be used to provide light accents to improve the overall ambiance of your dining room while setting an elegant tone. When it comes to modern dining room lighting ideas, track lights can be a great, affordable choice that are also easy to install. Track lights are a series of lights fitted on tracks that can be easily moved to focus on any point in your dining space, depending on your preferences. And track lights can provide a good amount of lighting throughout any room. When you go for track light dining room lighting ideas, there’s really no need to install other dining room light fixtures. And they can be unique to boot as one of our favorite dining room lighting trends 2018 was track lighting made with a matte gold finish instead of standard black or white. Recessed lights are dining room lights that installed in or close to the ceiling and make for a great choice for accenting a dining table, the furnishings surrounding it, and decorative elements like art and dinnerware. Recessed lights are also a great choice for modern dining room lighting ideas as they never go out of style and lend a room a clean minimalist look – and they help to eliminate shadows. Keep in mind that our interior designers advise maintaining proper spacing between recessed lights to keep the look simple and the lighting well spread. And they also recommend dimmer switches since levels of comfort zones vary on a regular basis when it comes to the level of lighting needed at the time. Vintage inspired Edison-style bulbs are perfect for rustic dining room lighting and for creating a glowing ambience. These are ideal for homeowners who are on the hunt for retro-inspired elements when sourcing dining room light fixtures. Their rounded cone style creates a comforting ambiance in any dining space while working as possible conversation starters. You can also opt for Edison-style bulbs that feature energy saving LED bulbs. They consume less power and guaranteed to last longer. However, if you want a more authentic retro experience for your rustic dining room lighting, use incandescent Edison bulbs. Investing in a ceiling fan boasting lights is a great idea for casual dining room lighting approaches. Practical and great for smaller rustic dining room lighting approaches as you’re sure to find plenty of stylish ceiling fans with cleverly designed light fixtures. To create an intimate atmosphere with softer lighting while dining, our interior designers recommend a selection of lighting fixtures that are quickly dimmable to set a mood. However, if you want to enhance the mood, install additional wall sconces or alternative dining room light fixtures to compliment your ceiling fan. Industrial lights are a great choice when it comes to rustic dining room lighting ideas. Industrial lighting often boasts natural timeworn, neutral finishes and designs that put an emphasis on the use of metal. But instead of the usual warehouse-like lights which have become common in industrial interior decorating, go for industrial dining room lighting that features varied tones made of sleeker metals, like brass and matte finishes. Our interior designers also suggest choosing retro-inspired dining room light fixtures that have finer, more gender-neutral details ideal for rustic dining room lighting. One of the most effective dining room lighting design tips for creating a modern look is to opt for lights that have clean lines and simple silhouettes. Modern décor calls for clean forms and naturally, this applies to lighting as well. Therefore, if you’re seeking modern dining room lighting, our interior designers recommend choosing minimal, straight-forward lighting designs to complement modern interiors. And with minimalism even more popular than ever in 2018, you’re certain to find terrific low profile dining room light fixtures at a variety of budget-conscious prices boasting simple geometric designs and neutral soft tones.